Georgina Riel (her traditional name is Waabishki Mukwa Kwe, meaning White Bear Woman) is originally from Sault Ste. Marie, Ont., is a member of the Batchewana First Nation of the Ojibway and is Turtle Clan. She currently lives in Kingston, Ont., with her husband and two sons. It was wonderful growing up in an environment where learning was a family affair. My parents taught us how to raise animals, hunt, fish and make maple syrup. My aunties and uncles would come by often, and when they did they told the stories of days gone by — stories of their childhood and traditional stories told by our ancestors. I remember my parents taking us camping. On these excursions, we explored Lake Superior and, in particular, the territory of my people. One of our favourite spots to visit was the Agawa Rock Pictographs (which bear the same name as my paternal grandfather’s last name). Here, my dad would tell stories of our relatives who left the markings on the rock face walls dated from the 17th and 18th centuries. I was in awe of these remarkable images and how they were used by our people as a way of communication and mapping. Little did I know in my young, naive life that our family gatherings were actually the beginning of my teachings. They helped form who I am as an adult, walking the Red Road, balancing both traditional and contemporary urban life. Growing into my teen years, I did not fully grasp the impact that cultural genocide and colonization had had on my family and community. I was 16 years old when I heard my father speak Ojibwa for the first time. I was at the mall with my parents, and my father sat down for a coffee while I shopped with my mother. When we came back, my father was talking in low tones with his childhood friend. They were speaking in fluent Ojibwa! This was a very important moment for me. I wondered why my father never spoke to his children in Ojibwa, when I knew that our language is an essential piece of our culture and ceremony. I eventually found out that the reason my father spoke Ojibwa quietly was due to his experiences as a student in the residential school system. Indigenous children were forbidden to engage in any aspect of their culture — a huge loss for our future generations. Our family gatherings were the beginning of my teachings. They helped form who I am as an adult, walking the Red Road, balancing both traditional and contemporary urban life. As a young adult living in Toronto, I found myself reconnecting to ceremony on a deeper level. Throughout the city, there were many safe spaces to engage in various ceremonies. I was invited to make a traditional Anishinaabe hand drum on another Anishinaabe Nation’s territory. I engaged in ceremony by creating my drum, birthing my drum, awakening my drum and feasting for my drum. The process of finding ceremonial space was important for our people to continue sharing in our traditional ways without repercussion from the government. Even though I was many hours away from my home territory, other Anishinaabe Nations welcomed me to ensure we are connected to one another through ceremony. I was able to take part in pipe ceremonies, naming ceremonies and women’s teachings. I also participated in receiving colours ceremonies and sweat lodges. To this day, the smell of fresh cut wood and the burning of a roaring fire remind me of the time I made my first hand drum and participated in a sweat lodge; these moments are forever stitched in my memory. I have been honoured and humbled by the spaces offered to me and to other Anishinaabe people who live in urban centres. It is such a treasure that we can still reconnect to the land, even though our bodies are not physically rooted in our home territories. Laura Gagnon, Serena Lacosse and Gabrielle Fayant at an event in Ottawa. Fifteen years ago, I moved to Kingston, Ont., with my husband and first son (I now have two sons). After living here for several months, I was feeling the need to find ceremony and a place to drum. But I could never find a place that felt comfortable. The land had a certain vibration that left an unsettled feeling within me. I chatted with some other Indigenous people who were also newly rooted in Kingston. We came to the conclusion the land did not feel settled because of the many local battles between Indigenous and non-Indigenous peoples. What we were feeling was the residual energy on this land. We needed to conduct a ceremony at the waters to introduce ourselves to this territory. 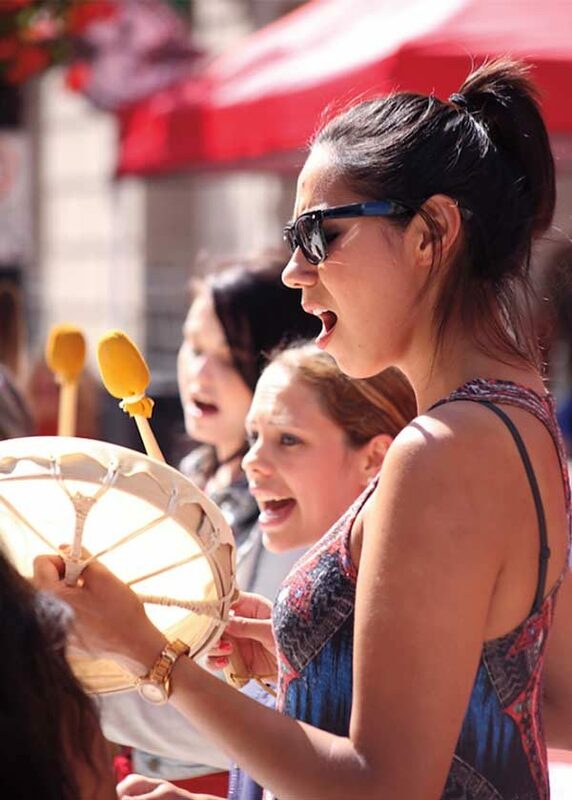 By using our drum and voices, through song we created a harmonious energy that allowed us to continue to safely perform our ceremonies and respect our nations’ cultural differences. I met an Elder shortly after arriving to Kingston, and she took me under her wing to mentor me on my new life journey. This journey was one of self-discovery, and I found myself needing to be around “my Anishinaabe people.” The safe space I had back in my home community to conduct and participate in ceremony no longer existed. I needed to have a ceremony of “self” in order to figure out how to navigate my need for connecting to the land where I now live. Learning the history of this territory was an important part of this journey. It helped guide me to know more about the original people who cared for this territory. Once I discovered that one of this territory’s original peoples were the Mississaugas of the Ojibwa, I knew there was more to learn. One of our teachings is to learn and listen to obtain knowledge. Once you have gained that knowledge, you should remain humble and share it. Learning how the Mississaugas of the Ojibwa shared in trading and ceremony brought me a sense of ease. I have come full circle in knowing my “self” and the importance of ceremony. It is an essential part of who I am, it is part of my DNA. The legacy of my ancestors is deeply rooted in my DNA. The need for ceremony has taught me that feeding my spirit in a good way will provide me with the strength to reclaim space in a respectful way. Always acknowledging the lands of the ones who came before us allows us to maintain a strong cultural connection regardless of where we live and is also essential to reclaiming ceremonial space in a respectful way. I come from an incredible, culturally strong and resilient group of people. I am the great-great-great-granddaughter of Chief Shingwaukonse, who was the first chief of our community. My people are the Midewiwin (medicine men and women), traditional language teachers, traditional pipe carriers, Elders, community leaders and warriors, and I am gifted as a knowledge keeper. I am rooted in ceremony at all times, regardless of where my feet land. Chi-Miigwetch to all my relations.